Chansey's official artwork from Pokémon FireRed and LeafGreen. 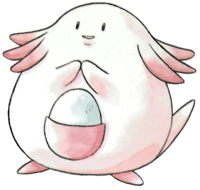 Chansey (ラッキー, Lucky) is a fictional creature in the Pokémon media franchise. Chansey's official artwork from Pokémon Red and Blue. 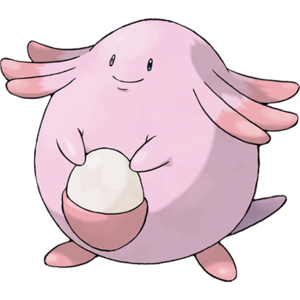 Chansey is a Normal-type Pokémon introduced in Generation I, and is categorized within the Pokédex at #113 as the "Egg Pokémon". It evolves from Happiny when leveled up while holding an Oval Stone in the daytime from Generation IV onward, and evolves into Blissey when leveled up with high friendship from Generation II onward. In the animated series and Pokémon Yellow, it is often found as the assistant of Nurse Joy in Pokémon Centers located in Kanto, Johto, Hoenn, and Sinnoh. Softboiled (reformatted as "Soft-Boiled" as of Generation VI) is a Normal-type move which heals the user for half its maximum HP. It can also be used outside of battle to transfer 20% of the user's HP to a teammate, although this will fail if the user lacks enough HP to donate. Softboiled is TM41 in Generation I, with Chansey and Mew being the only Pokémon capable of learning it. As of Generation II, it is the signature move of Chansey and Blissey. Chansey makes its debut in Super Smash Bros., using Softboiled to create three eggs which contain items in them. These eggs can also explode, and unlike normal items, they can be attacked before they land. Chansey also appears in the Saffron City stage. Unless items are turned off, it will use Softboiled to create a single egg when it appears out of the door of the Silph Buil. Also, it heals a small amount of damage when touching players, as opposed to the other Pokémon which cause damage. Chansey can be KO'd by characters and by items, although doing so grants no reward. Chansey reappears in Super Smash Bros. Melee. It functions almost identically to its appearance in SSB, except now it will create up to five eggs. These eggs, being normal Eggs, will either heal for 7%, contain an item, or explode. Chansey, like Cyndaquil and Marill, can be KO'd. A giant balloon of Chansey is one of the many floating and bending platforms that make the Poké Floats stage. Compared to the other balloons, Chansey's balloon appears and disappears rather rapidly and jerkily, but in a pattern. Chansey features as a collectible trophy, randomly obtained in the Trophy Lottery. The Chansey trophy in Melee. Renowned for its kind temperament, Chansey has been known to offer injured creatures its highly nutritious egg to aid their recovery. Legend has it that this charitable creature brings happiness to anyone who captures it. All Chansey are female, and every now and then one is found in possession of a Lucky Egg. Chansey returns on the Saffron City stage, with the same role it had on the stage in previous games. 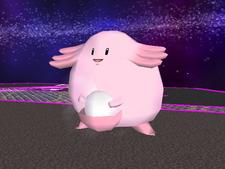 Chansey is one of three (and the first) Pokémon to be both a Poké Ball summon and a stage element in the same installment, as it is present as both in Smash 64 and Melee. Electrode and Palkia gained this distinction in Ultimate. This page was last edited on April 18, 2019, at 01:01.